“Dead, living, free, or in prison on the orders of the colonialists, it is not I who counts. It is the Congo, it is our people ... History will one day have its say, but it will not be the history that Brussels, Paris, Washington or the United Nations will teach, but that which they will teach in the countries emancipated from colonialism and its puppets... a history of glory and dignity"
(P Lumumba, Jan 10th 1961). August 26, 1960. In Leopoldville, the CIA station chief receives a cable from his boss in Washington granting him "wider authority along the previously authorized operation to replace Lumumba with a pro-Western leader." In the cable, the CIA directs its station chief in the Congo to use "aggressive action if it can remain covert. ... We realize targets of opportunity may present themselves to you." In this cable, the CIA makes available to the station chief funds in the amount of "$100,000 to carry out any crash programs on which you do not have the opportunity to consult the (CIA) HQS (headquarters). To the extent that the ambassador may desire to be consulted, you should seek his concurrence. If, in any particular case, he does not wish to be consulted, you can act on your own authority where time does not permit referral here." In the cable, the CIA assures the station chief that this message "has been seen and approved at the competent level in the State Department." CIA special operations chief Richard Bissell instructs his special assistant for scientific operations, Dr. Sidney Gottlieb, to prepare poison for use in the assassination of “an unspecified African leader." September 26, 1960. CIA special assistant for scientific operations Sidney Gottlieb arrives in Leopoldville (Kinshasa) with poison intended to be smuggled into Congolese Prime Minister Patrice Lumumba's residence and.put in his toothpaste and food. June 10, 1975. Robert H. Johnson, official notetaker at the 18 August 1960 National Security Council meeting at the White House tells the US Senate Intelligence Committee that he vividly recalls "Eisenhower turning to CIA director Allen Dulles in the full hearing of all those in attendance and saying something to the effect that Lumumba should be eliminated. That came across to me as an order for the assassination of Lumumba, who was then at the center of political conflict and controversy in the Congo." January 17, 1961. 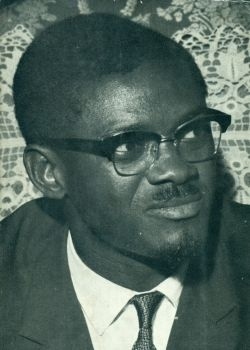 Patrice Emery Lumumba, prime minister of the Republic of the Congo, after being arrested and suffering a series of beatings, is clandestinely shot dead at Elisabethville and his body dissolved in acid, with no trace of evidence left behind. I write you these words without knowing if they will reach you, when they will reach you, or if I will still be living when you read them. All during the length of my fight for the independence of my country, I have never doubted for a single instant the final triumph of the sacred cause to which my companions and myself have consecrated our lives. But what we wish for our country, its right to an honorable life, to a spotless dignity, to an independence without restrictions, Belgian colonialism and its Western allies--who have found direct and indirect support, deliberate and not deliberate, among certain high officials of the United Nations, this organization in which we placed all our confidence when we called for their assistance--have not wished it. They have corrupted certain of our fellow countrymen, they have contributed to distorting the truth and to besmirching our independence. What else might I say? That dead, living, free, or in prison on the order of the colonialists, it is not I who counts. It is the Congo, it is our people for whom independence has been transformed into a cage where we are regarded from the outside sometimes with benevolent compassion, sometimes with joy and pleasure. But my faith will stay unbreakable. I know and I feel to the depth of my being that sooner or later my people will get rid of all their interior and exterior enemies, that they will rise up like a single person to day no to a degrading and shameful colonialism and to reassume their dignity under a pure sun. We are not alone. Africa, Asia, and free and liberated people from every corner of the world will always be found at the side of the Congolese. They will not abandon the fight until the day comes when there are no more colonizers and mercenaries in our country. To my children, whom I leave and whom perhaps I will see no more, I wish that they be told that the future of the Congo is beautiful and that it expects from them, as it expects from each Congolese, to accomplish the sacred task of reconstruction of our independence and our sovereignty; for without dignity there is no liberty, without justice there is no dignity, and without independence there are no free men. teach, but that which they will teach in the countries emancipated from colonialism and its puppets. Do not weep for me, my dear companion. I know that my country, which suffers so much, will know how to defend its independence and its liberty. Long live the Congo! Long live Africa!